46 Thus it is written, that the Christ would suffer and rise again from the dead the third day, 47 and that repentance for forgiveness of sins would be proclaimed in His name to all the nations, beginning from Jerusalem. 48 "You are witnesses of these things. 49 "And behold, I am sending forth the promise of My Father upon you; but you are to stay in the city until you are clothed with power from on high." The Ascension 50 And He led them out as far as Bethany, and He lifted up His hands and blessed them. 51 While He was blessing them, He parted from them and was carried up into heaven. 52 And they, after worshiping Him, returned to Jerusalem with great joy, 53 and were continually in the temple praising God. We are in the midst of the parting hour. Jesus shall part from his disciples, and no longer wander among them, such as they have known Him up till now. But Jesus describes this as something that is to their benefit (John 16:7), because then He shall come to them on a completely new way. He shall Himself, dwell in their hearts, by His Spirit. (John 14:18). In John 14:23 Jesus reveals for His disciples, in all its glory, that which is intended for them, as He speaks about The Father and Himself and says: "We will come to him and make Our abode with him (dwell within you: Norw.transl.)." Something the disciples most certainly did not understand much of at this time. In the verse before our text begins - v.45 - it sounds: "Then He opened their minds to understand the Scriptures." That is the important thing, that you get part in The Words testimony about Jesus. It is there The Holy Spirit guides you, and not out in an endless chase for manifestations. Jesus now stood before the time, when He should be revealed as a conqueror in front of Gods throne in Heavens Holy place, and The Father should send His Sons Spirit into the believers hearts. Jesus now should, on a completely new way join His friends. That is what Jesus speaks about in verse 49 here. God Himself should now, on a particular way, dwell within them. "He will dwell among them, and they shall be His people, and God Himself will be among them." (Rev. 21:3). This, which one day shall happen fully, visible to all men, has also happened already by the fact of Jesus‘ act. Father, Son and Holy Spirit is dwelling within man (John 14:23), and man is dwelling in heaven. (Eph. 2:6). This is how the Word of God describes it! It is impossible to comprehend any of these things, except in the light of the doctrine of the Trinity - Father, Son and Holy Spirit is one true God. This is about what one can be able to know, about the completely new that took place on Whit Sunday, and that it was not possible before after Jesus‘ act. But The Holy Spirit was, after all, with the disciples before Whit Sunday too, as He also was with the faithful in the time of the old covenant. No one can, after all, believe in Jesus without The Holy Spirit (1 Cor. 12:3). But a natural man does not accept the things of the Spirit of God, for they are foolishness to him; and he cannot understand them, because they are spiritually appraised,” says Paul in 1 Cor. 2:14. But now the time was approaching, the time which Peter calls: "The sufferings of Christ and the glories to follow" (1 Pet. 1:11). The glories to follow! Do you know, that is the time you are living in now! You are living in the time after The sufferings of Christ! After all that is fulfilled which had to be fulfilled! After Jesus‘: "It is finished!" 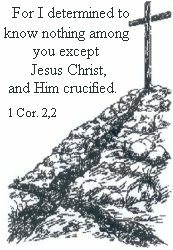 (John 19:30) - from the cross. Read what Jesus first of all preaches unto his disciples, after He had "opened their minds to understand the Scriptures: "Thus it is written, that the Christ would suffer and rise again from the dead the third day, and that repentance for forgiveness of sins would be proclaimed in His name to all the nations, beginning from Jerusalem." (v.46 - 47). What was claimed as payment for the salvation of the world? What was claimed as payment for your salvation? The entire Script testifies about it, says Jesus. In the narrative about the so-called ”Emmaus wanderers” earlier in the same chapter by Luke, it sounds: "Then beginning with Moses and with all the prophets, He explained to them the things concerning Himself in all the Scriptures." (v.27). And what it is - and what which accordingly had to be paid for your salvation, that is revealed unto you by Jesus here, as He says: "It is written, that the Christ would suffer and rise again from the dead the third day." (v.46). But now that is, after all, exactly what has happened! What had to happen, has happened! There are so many who never see (believe) this, and therefore never enter in to His rest, but strive more or less with their own religious activities instead. That can be everything from a simple evening prayer (just in case! ), to deep theological studies, humanitarian contribution, mission and ecstatic "wonderful" experiences. But without this, everything else is in vain - yes, it becomes on the contrary of what it was meant to be - namely Christian life - instead it hides for them their true condition. - You have not come in to His rest as a helpless lost sinner! What help would it do, if the disciples had begun to study theology, if Jesus had not opened their minds? "To you has been given the mystery of the kingdom of God," says Jesus about his own ones (Mark 4:11). "Of grace everything I get, of God from first to last." That is the testimony of a child of God! You get because you are children! I.e. for Jesus‘ sake! Psalm 127 speaks of it like this: "It is vain for you to rise up early, To retire late, To eat the bread of painful labors; For He gives to His beloved even in his sleep." "You are witnesses of these things." (v.48). Accordingly, that Christ who had to suffer and arise on the third day, has suffered and arose on the third day! That is a believers testimony. And Jesus is not saying: You shall be witnesses! But: You are! Because they had been eyewitnesses to this. So also with us - we cannot witness about this before Jesus has revealed Himself for our heart, and we thereby have come to belief! No one can take what it takes to be a witness, it must be given. At once a human has come to belief in Jesus - i.e. this which is preached here in v. 46 - 47 - he is a witness. "Repentance for forgiveness of sins would be proclaimed in His name to all the nations." (v.47). Conversion is usually understood - and the preaching has great guilt in this - as a moral improvement. And surely it stands firm, that the will of God, which is expressed in the Law: He has no delight in sin and misdeeds! But this is not what Jesus speaks about here. He speaks about conversion to The Life. About to turn to Him! In the well known speech on Mars‘ hill in Athens, Paul is preaching: "Being then the children of God, we ought not to think that the Divine Nature is like gold or silver or stone, an image formed by the art and thought of man. "Therefore having overlooked the times of ignorance, God is now declaring to men that all people everywhere should repent." - Accordingly from this we are reading about here, it is talk about a conversion from - our own thoughts about God! And it continues with Gods own revelation: "Because He has fixed a day in which He will judge the world in righteousness through a Man whom He has appointed, having furnished proof to all men by raising Him from the dead." (Acts 17:29 – 31). Conversion is accordingly this, that God strikes the ignorance - our own thoughts about God and the way to Him - out, and reveals Himself and His salvation unto us, by "the message of truth, the gospel of your salvation." (Eph. 1:13). It is accordingly, basically, a Gods act! "...for forgiveness of sins." (v.47). Stop now! long and thorough for this, you who strive so heavily with yourself - and maybe - with your many sins. Or is it maybe one particular sin, that lies so heavily upon you, that you barely can rejoice at anything at all - and the moments of joy you might have, is of short duration because of your sin. Listen! Jesus is sending out his witnesses, and what are they going to testify unto you? Yes, forgiveness of sins! And conversion! In other words, now you shall be able to turn yourself away from this darkness, in which you think and believe that He will judge and condemn you for the sake of your sin. He has come to save you! To preach you forgiveness of sins! And, after given the disciples this blissful message, He parted from them, while He was blessing them, and was taken up to heaven. But just you wait, my friends - my brothers - a short time in the town (Jerusalem), and I am coming back to you again, in a way you never ever could have thought of. Stand and consider this: Jesus left this world, bodily, with His hands lifted to blessing for His own ones. "They,...worshiped Him." (v.52). Here you see whom they believed Jesus to be! As Jews they were well acquainted with the first commandment: "Do not have any other gods beside Me."